"3LA1, V-2009" by Timothy K. Perttula and Robert Z. Selden Jr. CONTEXT INFORMATION: From a grave (Burial 1) in Burial Plot 3 (Martin 1939). Associated in the grave with V-2007, V-2008, and V-2010 to V-2013. 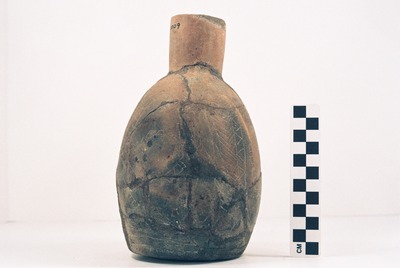 DECORATION: The top and bottom of the vessel body have either two or three horizontal engraved lines. The remainder of the body has a series of three engraved concentric circles and hatched vertical panels. Each concentric circle is different: the first has four concentric circles, the outer two forming a narrow hatched band and the inner two having small pendant half circles; the second has two concentric circles, the outer engraved circle having small pendant half circles; and the third has three concentric circles, with the inner two circles having small pendant circles. Figure A1-93. cf. Handy Engraved bottle (5425-759).